ANSWERS? WE’VE GOT THEM. These are the topics we have been discussing most frequently regarding public site furniture. We have a wide variety of colors of powder coating to choose from, e.g. blue, red, black, green, yellow, silver, etc. Special colors, such as pink, light green and orange, are also available, but with minimal extra fees and longer lead time. These are some popular colors that we stock on a regular basis. An international RAL color code is mandatory for custom colors, and all colors are theoretically available. A list of RAL colors can be found here: ralcolorchart.com. Customers could also select glossy or matt options, free of charge. 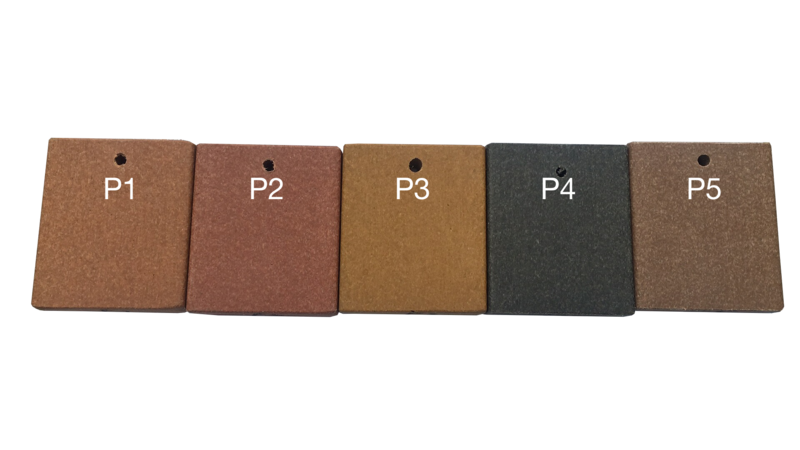 Metallic colors that contain shinny metal particles are feasible, but require samples for color matching. All parts could be powder coated into different colors for unique preferences and designs. Plastic wood is capable of mimicking colors and textures of wood, but in the meanwhile thanks to stable chemical property of plastic, no corrosion and cracks would occur. A bench made of this synthetic material is an enjoyable place to sit on, as a result of its adequate softness. Following pictures listed the options of HDPE (High-density Polyethylene) plastic lumber . Please contact us for availability of the materials prior to placing order. Options may experience shortage during certain periods of the year. We could send plastic lumber samples for final approval of the purchase upon request. Sunperk seeks innovating. So do our customers. Certain customers have special requirements or even have their own designs. The frequent requests including but not limited to adjusting lengths of benches, ADA / handicap compatibility, and adding specific sizes of umbrella holes to picnic tables. We offer full customization either on our current models or your own design to help you accomplish successful projects. Feel free to contact us to discuss any possibilities. Sunperk accepts business cheques, VISA, MASTERCARD and AMERICAN EXPRESS. Credit cards have maximum spend limit of $2,500. 50% deposit to place order, and 50% before delivery. Orders will be placed only upon receiving of deposit. Governmental purchases do not require deposits, but a formal purchase order. An usual lead time is about 8 weeks for customized product. We are relatively busy during spring and summer. Lead time also depends on customers’ position on the wait list as well as the weather, specifically windy and snowy winter conditions. Lead time may be also affected by requirements of matching colors and ordering rare colors, or any other special requirements. Usual lead time is about 8-10 weeks for customized product. We are relatively busy during spring and summer seasons. Lead time also depends on customers’ position on the wait list as well as the weather, specifically windy and snowy winter conditions. Lead time could also be affected by requirements of color matching and ordering rare colors, or any other special requirements. We have many customers inquiring about memorial benches. It is important to treat the benches carefully as much as we care about the ones who brought us beautiful memories. Here are some helpful info. We only supply benches, and customers need to out-source laser printed stainless steel plaques. There are plenty of workshops, so don’t worry. Choose recycled plastic benches over metal benches. Installation of memorial plaque needs drilling holes on the bench. In the case of metal benches, drilling holes exposes raw metal to the air, and over a period of time, corrosion initiates and migrates to other part of the bench, and resulting in large area of rusting. However this scenario would not happen on recycled plastic benches. Plastic wood benches is easier for screwing on memorial plaques, compared to drilling holes on metal benches. Possibility of loosening of screws that attach plaque to the bench may causing unpleased noise when plaque is contacting the metal bench. If an unsuccessful drilling is performed, it may require replacement of whole metal bench, but in case of recycled plastic bench, simply replacement of a lumber. Feel free to CONTACT us, if the above topics won’t answer your questions. We will reply you as soon as possible.